Char broil the Big Easy TRU infrared oil less turkey fryer is a great cooking tool. It is a very easy fryer with a very few but powerful feature. You don’t need any oil to burn, spill or splatter. That will obviously save your money and also decrease your mental stress. It delivers flavorful results after every cooking that is why you may also fall in love with it. It is specially design to fry turkey. Propane gas burner provide proper infrared heat to the turkey. This process spicy and crispy turkey can be fried. Its cylinder body perfectly stand any where in home or out. 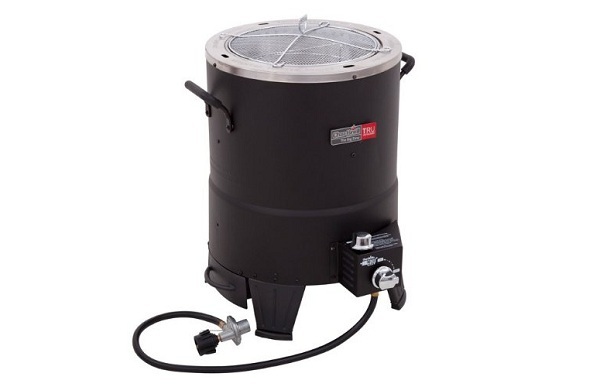 If you have a look at the outlook of the Big Easy TRU infrared oil less turkey fryer you will see it like a drum. But think about its shape, it is specially designed to fry turkey. Its inside there is also a cylinder type tray. You can easily pull in up and down by its handle. A cool touch handles also added with it body so that you can move the whole fryer easily. The cooking chamber is made with stainless steel so no fear about iron and also very easy to clean. The infrared energy comes from the double wall heating chamber. The top cover make sure about moisture so you will feel the awesome taste of the turkey. This fryer takes 3 to 5 minute to fry 1 lb of turkey. No need of pre-heating. The attractive matter is that can cook 16 lb of turkey at a time. You can perfectly manage a family party with this Big Easy TRU infrared oil less turkey. To enjoy your weekend with a festive mind you can use it. Just carry it with you and the small fuel tank. Prepare your turkey with spices and put it into the fryer then do enjoy till the turkey is ready. But remember something when you use it at the first time. After unboxing turn on the fryer for 15 minutes this will make your fryer prepare for long lasting cooking. When you will finish the first cook spray pam in the infrared panel and keep the fryer on for 10 minute. And also another thing after every cook you can rub peanut oil through the whole body of the fryer. This will make your fryer long last. Very easy to clean, to clean the turkey holder come it out from the oil less turkey fryer and wash as your wish. You can easily clean the stainless steel cooking chamber with direct water or can use a towel. No need to unfold the chamber, there is removable grease tray for easy cleanup. In a nut shell you can clean it as your wish but handle it carefully avoiding broken. Remember proper cleanup ensure you a healthy food always, isn’t it? Although it is a very simple and awesome cooker always make sure about the safety. Don’t touch its body while cooking which may burn your skin. And keep children in safe range from the Big Easy fryer.